Displaying a list of your recently published articles on your website or blog is easy with the power of RSS! RSS (also known as XML) stands for Real Simple Syndication and is a way for people interested in certain topics to quickly get new information, news and other good stuff without having to wade through tons of web pages. 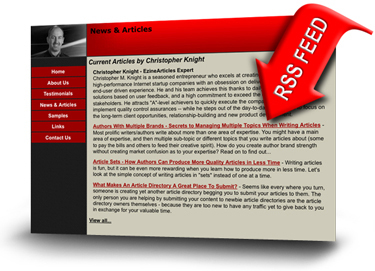 RSS Pages are not meant for the human eye, but rather for RSS Readers or Aggregators. Every EzineArticles Expert Author has an RSS feed of their articles, which means if you’re a Member with at least one published article, you have an RSS feed that contains a title, link, description and published date of your articles. You’ll be taken to a web page depicting your RSS feed. Copy the URL for that page onto your clipboard. Paste the URL into the appropriate field in your RSS module or plug-in application. No matter how you slice it, using the EzineArticles RSS feed to promote your own articles just makes sense. If you’re not currently using this powerful tool, go add it to your site today! Then come back here and tell us about it by leaving a comment below. * Note: Adding RSS feeds to your website requires intermediate-to-advanced web authoring skills and may be too challenging for beginners. EzineArticles Member Support cannot provide support for RSS feed implementation. I never thought I can make use of EzineArticles RSS feed. I’ll use this feature once I crossed at least 10 articles in my profile. Tremendous! Operation successful! As per your instructions I went ahead and used Google to get the URL. Copied it and pasted on my blog with the title as ‘RSS Feed’. The link is instantly active and throws open all my articles. Author articles not foundSorry, no articles from the author requested by this widget could be found at EzineArticles. I think I have around 200 articles but I can’t seem to log into my acct. to check. Will this also work for authors that have lots of articles? Or would it crash your data base and that of the author’s site to do it? RSS services are READ only and they are protected from scrapers; so the chances of database crashes from RSS use would be rare. We’re in a very unusual circumstance today… Hopefully by the time you read this blog comment, all systems will be fully restored. It’s 1am CST right now and 5 of our developers are still here working on the issues that have taken us up and down for the past 12 hours. Current problems are related to hardware failures and we’ve cut over to our hot spare; but the transition was not as smooth as expected. We won’t sleep until all services are fully restored. Morning Chris, Everything is back to normal. You guys are great. If there’s ever a problem (which is very rare) it’s taken care of ASAP. I love this feature as well as the widgets. I put them on my sites, blogs, etc. I also use the RSS feeds of other authors in my iGoogle page. This is great news! I love Ezine! First rate all the way! Superb, will check out the feature and the widgets as worthwhile additions to my sites. Now just need to increase the number of articles I have…. Very helpful post. I got my rss feed up and running smoothly, thanks! Thanks for the post! I will definitely check out this feature. It was a very good article and satisfying. I remember the times that I comment on blogs that are not posted, well, it is a big help for me and to my business. Thank you so much for explaining each and every step so clearly. This is a great help as I was planning to post a few articles on my website. Thanks!